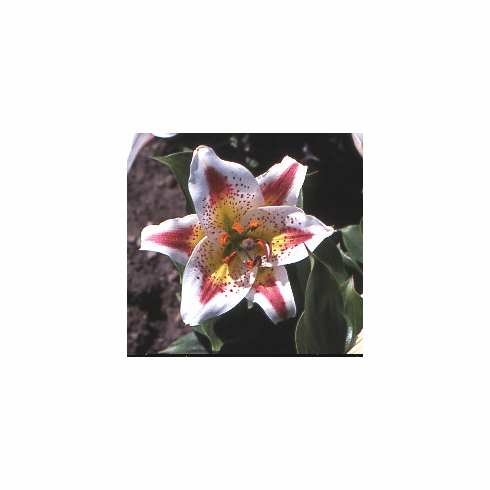 A selection from 'Pictum' seedlings by J. S. Yeats of New Zealand in 1953, and sold under the name of 'Little Gem', the late Mr. Harve Strahm of Brookings, Oregon worked with this lily for years, but finally gave up due to its resistance to make large size bulbs. Typical three and four year crops produced only three to four-inch circumference bulbs with anywhere from two to four noses, which would only have one or two flowers. It was also prone to botrytis and rot during the winter months while dormant. Photo inset #1 is of a variety of L. auratum var. pictum as grown by Edgar Kline. This photo from Bill and Mary Hoffman was taken around 1950. You will notice right off that the flower form is larger and less cupped than the Yeats selection of this species. Photo inset #2 is L. auratum var. pictum as grown and photographed by Joseph Nemmer.